General Electric and Rockwell Automation are for risk-seeking investors willing to take a contrarian view. For the better part of three years, GE has faced significant doubts over its earnings guidance and its long-term strategic plans. But with a new CEO, that could be set to change. General Electric and Rockwell stock could be set to fight back from a dismal year in 2018. Image source: Getty Images. Gong back to 2016, the company missed its revenue target, and it hit its earnings target only by generating earnings from noncore sources. Fast-forward to 2017, and then-CEO Jeff Immelt stubbornly stuck to a target of $2 in EPS by 2018 even while there were significant doubts over it. Immelt was ousted and replaced by John Flannery as it became clear that GE would fall significantly short of 2017 guidance, let alone Immelt's $2 in EPS, by 2018. Flannery promptly cut the dividend and attempted to reset expectations, but from the start, the new plan didn't look viable. The power segment continued to deteriorate, and analysts cast doubt on GE's ability to achieve its aims in 2017. Unmoved, Flannery spent most of his short tenure clinging to earnings and free cash flow (FCF) targets that looked increasingly untenable and cast doubt on the viability of its debt-reduction plans. The rest is history: GE was forced to abandon its 2018 targets and appoint Larry Culp as CEO in an attempt to steady the ship. GE still faces significant challenges. It has more than $115 billion in net debt, there are doubts over potential tax and insurance liabilities, and the troubled GE Capital remains a drag on the stock's valuation. That said, Culp looks to be resetting expectations in a more realistic way than previous management, and the stock price has already discounted much of the bad news. Investors can expect another solid year from GE Aviation and GE Healthcare. Meanwhile, GE Power could emulate the low-single-digit margin that Siemens is expecting this year. Some analysts are expecting the current portfolio to generate around $4.8 billion in FCF in 2019. If so, based on the current market cap of $65.9 billion, GE would trade on a forward-market-cap-to-FCF multiple of 13.7 times -- a very attractive number. Moreover, GE's FCF is being temporarily suppressed because of the ramp-up in production of LEAP engines at GE Aviation and issues at GE Power that will improve -- restructuring charges, the turbine-blade failure issue, and the discounting of HA turbine equipment sales. FCF should improve in the future, and with it, GE's stock price. Speaking of FCF, Rockwell has long been one of the best generators of it in the industrial sector. The industrial automation company is the definition of a cyclical play on the industrial sector -- the sector's capital spending is Rockwell's revenue. Companies expand capital spending when markets are good, and seek to cut it when times are bad. In 2019, Rockwell clearly faces headwinds. For example, global automotive sales have peaked and oil & gas company capital spending could be pared back in response to falling energy prices. Throw in a general slowdown in U.S. industrial production and an uncertain outlook for China and Europe, and CEO Blake Moret's expectation of good growth from heavy industries and oil & gas in 2019 can be called into question -- overall, Moret expects 3.7% to 6.7% organic revenue growth in 2019. While there is near-term downside risk for Rockwell, the stock is attractive for long-term investors for three reasons. First, while Rockwell may face near-term cyclical challenges, its long-term secular growth drivers, namely the Industrial Internet of Things and the increasing use of automation and robotics in manufacturing, look assured. 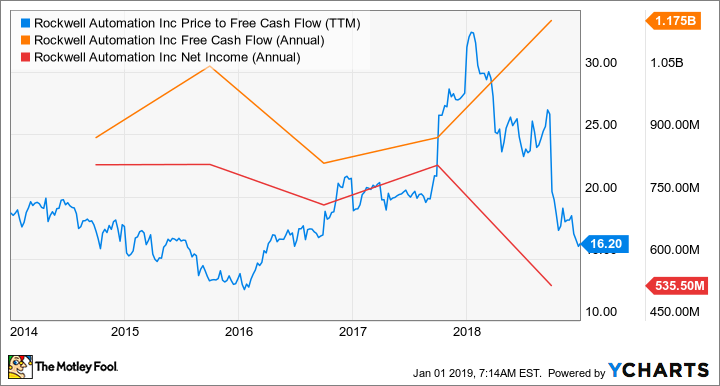 Second, as you can see in the chart below, Rockwell is very good at converting net income to FCF, and based on its current market-cap-to-FCF multiple, the stock is cheap. Put another way, the company is currently generating 6.2% of its market cap in FCF. So even if Rockwell disappoints in 2019 and produces only flat FCF, the stock is still a good value. ROK Price to Free Cash Flow (TTM) data by YCharts. Third, Emerson Electric bid $225 for Rockwell at the end of 2017 -- a 50% premium to the current share price -- and this should serve as a reminder of how much of a strategic asset Rockwell is to a prospective buyer. The industrial automation market is dominated by European players such as Siemens, ABB, and Schneider Electric, and as the key U.S. player, Rockwell is an attractive asset. Check out the latest Rockwell Automation earnings call transcript. Are these stocks to buy in 2019? GE and Rockwell are only for investors who are willing to tolerate risk, and near-term risk in particular. That said, they both look like a good value for investors willing to take the long view; just don't expect it to be an easy ride.